Funny looking little antennae for radio on rear of cube. No problems since purchase 2013, paid for, new tires to replace original in 2017. That is it, nothing to repair yet. Easy to service and good mileage, big interior and head room. I love searching yard sales and antique stores and am amazed at what I can haul in the rear of my cube. A single bed mattress and springs fits perfectly. Also the one door lock with key or click is handy, and safer that 4 door locks. Children are prevented from opening the back doors and rear area by the universal lock control on driver door. I like the back seat area when I take that seat out it hold a lot. I tall so I like the fact that it has so much leg room the front area never feel crowded it very quiet when I am. Driving in town or on the highway I have had no major repairs the features are simple which I like so there not a lot to worry about things breaking. the paint has held up. I live in Texas so we get a lot of sunny days. the back is great when the back seat is out I am able to carry a lot of furniture and stuff for my resale repurpose business it been very reliable the performance has been great. Enough space to move around. It has a wonderful turning radius and has had minimal issues. The device to work the window acts up sometimes but other than that it is good. There is plenty of room in terms of head space and leg room and it is very good if you are tall. The seats are comfortable and the car is easy to use. Like I said it has a very good turning radius. It is also compact but also feels like it has enough room. Very good if you want a compact car with a good amount of space inside. 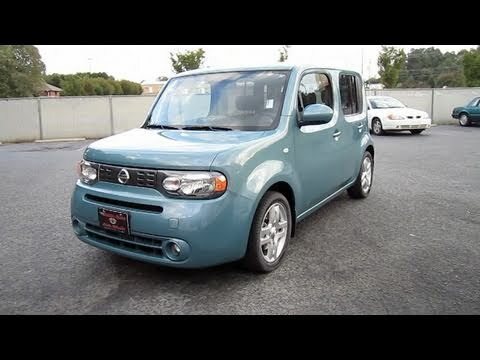 NISSAN IS RECALLING MODEL YEAR 2009-2010 NISSAN CUBE VEHICLES MANUFACTURED FROM JANUARY 30, 2009 THROUGH JULY 30, 2010. THESE VEHICLES FAIL TO COMPLY WITH THE REQUIREMENTS OF FEDERAL MOTOR VEHICLE SAFETY STANDARD NO. 301, "FUEL SYSTEM INTEGRITY." WHEN THE VEHICLE WAS ROTATED FOLLOWING A REAR MOVING BARRIER CRASH TEST AS REQUIRED, THE AMOUNT OF FUEL LEAKAGE EXCEEDED THE ALLOWABLE LIMITS. DEALERS WILL DEVELOP A SPECIAL PROTECTOR AND ATTACH IT TO THE GASOLINE RECIRCULATION TUBE AT THE LOCATION OF THE FILLER NECK CONNECTOR. THIS SERVICE WILL BE PERFORMED FREE OF CHARGE. THE SAFETY RECALL IS EXPECTED TO BEGIN ON OR BEFORE AUGUST 30, 2010. OWNERS MAY CONTACT NISSAN AT 1-800-647-7261.